There are four activities that can typically reach persons at all stages of Alzheimer's disease. Being visited by a child is one of them, as young Max discovered. Others include having a visit from a pet, listening to or playing music and observing or creating artwork. Max Wallack's great grandmother, or "great grams" as he called her, was in the last few weeks of her life. She was living in a dementia facility and couldn't speak, couldn't swallow and really seemed to be "gone." A teenager at the time, Max was his great grams' caregiver. He tells the amazing story about what happened one day when a nurse's aide brought her baby to work. "Great grams brightened up when she saw the baby," he said. "She spoke and actually said how cute the baby was." It's a well-known fact that children can reach demented people at a deep emotional level that adults often cannot. Faces may remain blank when an adult enters the room, but when a child walks in, those stares may turn to smiles, even for patients in the latest stage of the disease. Children can often interact successfully with people who have Alzheimer's. To get some specific ideas of how they can do that, check out the Alzheimer's Association website, which has a list of 101 things a child can do with an Alzheimer's patient. Arranging for a beloved grandchild or other young child to visit may be just what the doctor ordered. When doing so, of course, be sure the child wants to visit and feels comfortable doing so. For guidance in dealing with children whose grandparents have Alzheimer's disease see "Grandma has Alzheimer's." Much like children, animals can often touch demented people more deeply than humans can. "One of the joys of persons with dementia that seems to remain intact, untouched over time, is the joy created by a visit from a pet," says Susan Gilster, executive director of the award-winning Alois Alzheimer Center in Cincinnati, Ohio. The key, she says, is that animals don't judge. They love the individual with dementia unconditionally and express their love actively to the delight of the patient. "Soft fur, a wet tongue across the face, even a bark brings a smile to all the faces," she adds. There was a late stage Alzheimer's patient at the Alois Center whose face a dog licked when a visitor held him up for her to see. When the visitor told her the dog, Peter, didn't usually "kiss" people he didn't know, she immediately answered, "Dogs are very selective." That was the first lucid remark she'd made for months. Music also has the power to reach Alzheimer's patients on a profound level. It can have positive effects on their health and social functioning. Often times late-stage Alzheimer's patients can sing songs, including the lyrics, long after they've lost the ability to recognize loved ones, dress themselves or remember what happened five minutes earlier. In fact, music may be the only thing to which some late stage patients will respond. "It is remarkable how music can penetrate the mind of an otherwise severely impaired person with Alzheimers," says Gregg Warshaw, M.D., former president of the American Geriatric Society. He says he's seen patients who can barely walk get up and start dancing to music. "Others start clapping and singing," he adds. 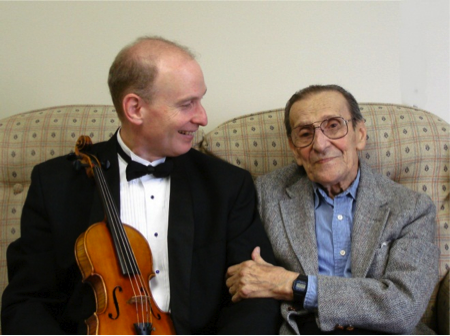 In my memoir I describe the time I hired a classical violinist to play a concert just for my loved one, Dr. Edward Theodoru, in his room at the Alois Center, his nursing home. In the photos I took of him sitting next to the violinist, he looked as contented as I'd ever seen him. For details about how to use music with people who have dementia, see "Music and Alzheimer's Disease: Using Music to Engage, Comfort and Bring Joy to Your Loved Ones." Lester Potts had largely stopped smiling prior to his enrollment at an Alzheimer's daycare center that offered art therapy. He had never created any artwork. Nonetheless, he began painting striking pictures and became an artist of national acclaim. According to the Alzheimer's Association, the ability to express and connect through art in a safe and social environment can help bridge communication gaps and increase self-esteem for persons with dementia. The creative process is as important and meaningful as the art work itself. The Alzheimer's Association has a program called Memories in the Making, a unique fine arts program for people with Alzheimer's disease or other dementias. The program provides a safe and validating environment for artistic expression, resulting in a creative and non-verbal way to communicate and capture precious moments through art. You can arrange various types of art projects for your loved one. Common activities include painting with water colors, coloring with crayons, making scrapbooks or molding objects out of clay. If your loved one is able to go out, a trip to an art museum could also be very beneficial. Just looking at art, much like listening to music, has been shown to calm people with dementia. So there you have it -- children, pets, music and art. If you have a loved one with Alzheimer's experiment with these and you may find one or more will be richly rewarding for both your loved one and for you. For more by Marie Marley, click here. For more on Alzheimer's, click here.